Czech Women's Lobby started as a network of three non-governmental organisations (Czech Women's Union, the Union of Catholic Women and Gender Studies), which were united in commenting on government documents and in lobbying for the creation of a government institution that would deal with gender equality. Their efforts were successful, and in 2001 the Council for Equal Opportunities for Women and Men was founded under the Ministry of Labour and Social Affairs, and joined by the representatives of non-governmental organisations (hereafter NGOs). This activity marked the beginning of a collaboration of women's NGOs. The European network of EWL contacted the Catholic Women's Union even before the Czech Republic joined the European Union, when addressing the candidate countries, and urged them to establish national representation. 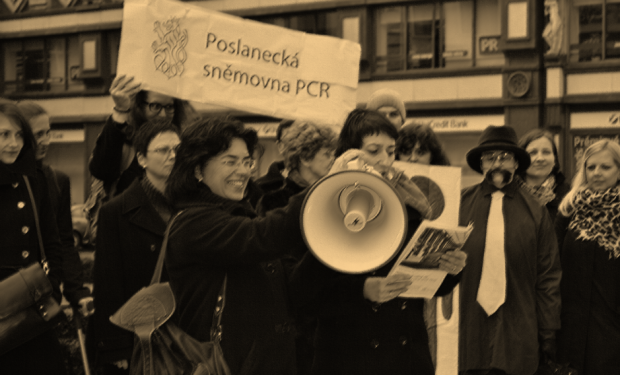 In the summer of 2004, the above-mentioned NGOs decided to establish a national coordination and urged other organisations to connect and form a Czech network that would be a member organisation of the European Women's Lobby. Czech Women's Lobby became an official member of the EWL in 2005. In 2008 CWL created the strategy for the following season and started the registration as a separate legal entity. In 2008 and 2009 CWL systematically lobbied for the adoption of the Anti-Discrimination Act, worked with the European Women's Lobby, and after a strategic meeting of women – WOMPASS, developed approach to the financial crisis. In March 2009, the chairwoman of CWL, Alexandra Jachanová Dolezelova , attended the 53rd session of the UN Commission on the Status of Women. In the period from October 2008 till June 2009 Czech Women’s Lobby implemented a project “Promoting Gender Equality in the era of PRESS CZ”. In December 2009, the Czech Women's Lobby organised the “Conference of Women in armed conflicts and peace processes: Conference on the Implementation of Security Council resolutions of the United Nations (UN) no. 1325 on women, peace and security and no. 1820 on sexual violence during armed conflicts. In the period from January 2010 to June 2010 CWL implemented a project to mark the 100th anniversary of International Women's Day. The IWD ​​celebrations, organised by CWL, took place during the week of 08-12/03 in Prague, and had the goal to highlight the international commitments and deeds that Czech Republic has signed, which are the basic building blocks for compliance with gender equality in the Czech Republic and worldwide. In cooperation with other organisations CWL prepared an alternative report on the implementation of the UN Convention on the Elimination of All Forms of Discrimination against Women. On Monday, October 11, 2010 CWL introduced to the UN Committee for the Elimination of All Forms of Discrimination against Women the declarations based on the alternative report.